Eyefootball is an easy to use football site. You can use eyefootball just for reading news - or you can become an active contributor to the site. Reading news on this website is easy. When you come to our website at our index page, you will be presented with three columns: the centre column which contains the links to each article on the site, the left column which contains the top news stories and the ingress from the article, and the right column which includes some feature snippets. In addition, you will also be able to utilize myEye. This is where active users from the website have created football scout player reports, active discussions are available for you to chat with fellow football fans and latest user articles. From the blog section, you will find some football stories written by fellow eyefootball users. If you create your own account, you will be able to choose your favorite club and myEye will also contain latest stories relevant to your club. Alternatively, you can read the news by using our own news filter. This page is the equivalent of an archive, and news can be found relating to a specific league - whether the Bundesliga or the Premier League; you can have the football news the way you want it. If you love RSS and use blog readers; why not consider using our RSS feeds? 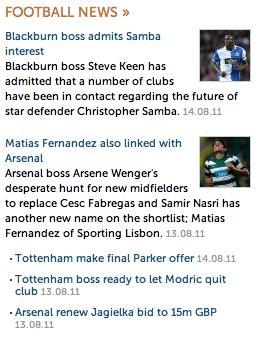 We have two seperate feeds, one for the latest news and one for the latest transfers. These XML feeds can be placed directly into your reader and the articles are refreshed at least every hour. We are always looking for football writers who are willing to help write regular football stories for our website. However, if you are an occasional writer and prefer only to write a football story only very occasionally, here is the step by step guide to get going. On the right hand side, when you are logged in only press create. Here you will enter your title which should be under 28 characters. Press submit article. Step 2 involves you writing the article content as seen in the picture to the right, you will be presented with two boxes. The first box is the main paragraph (one paragraph only) where you will write the header to the article. This paragraph is displayed on the index page and is displayed in bold font. The second box will contain the main article content. This content is where you can enter any text relating to the football story. This article content will be saved and will go through the moderation process. Your article may or may not be slightly modified (with your permission). The final step will be chosing where you wish to place the article in relation to our database, as seen to the right. It would help us if you choose the League you wish to place the article in from any of our European leagues including Serie A, La Liga, Premier League and Bundesliga. If you still haven't signed up... it's time you did. It only takes 2 minutes and it'll give you full access to eyefootball's services. Sign up for an account.